In the documentary Gasland, the negative effects of fracking in upstate New York were undeniable by the images of someone lighting their tap water on fire. 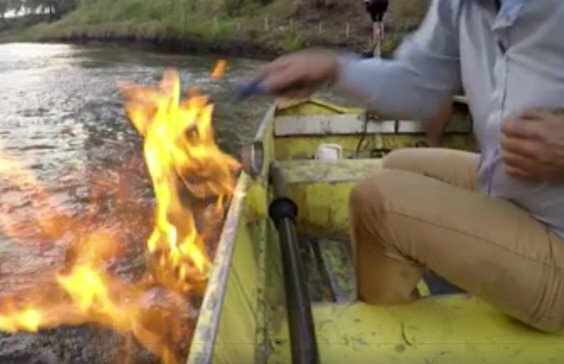 Now a video from Australia is going viral of a politician who lights a river on fire near local fracking and coal seam gas mining sites. Australian Greens Party representative Jeremy Buckingham, who’s led a fight against coal mining in New South Wales, said he was shocked by the explosion. Buckingham posted a video of the river lighting to Facebook and it’s since gone viral. According to Buckingham, gas had started bubbling out of the Condamine River not long after coal seam gas industry took off in the Chinchilla area. The practice involves extracting the methane produced by large deposits of coal. The problem of methane gas bubbling is well known to authorities who promise they are working on the problem. But in many areas the response has been slow. A news report from Douglas Park on the Napean River report gas bubbles have reappeared near two large mining operations in the area. One fisherman said the gas was killing fish.